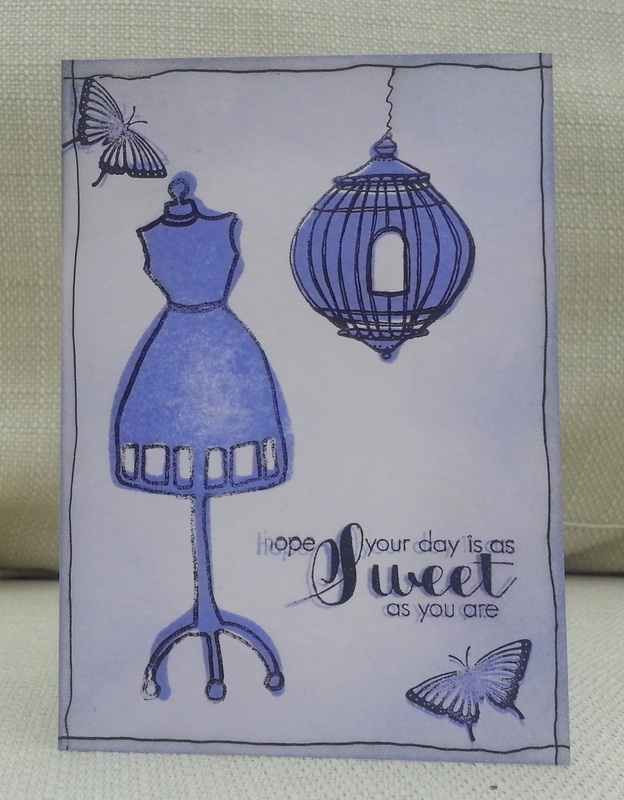 This is the card I sent to my dear blogger friend Kylie for her birthday last week. The dress form and cage are from a Claudine Hellmuth set where you get a solid foam stamp and a matching acrylic stamp. The butterflies and sentiment are from a Clearly Besotted set. I stamped them twice, once in lilac and then again in black, in keeping with the slightly blurred look of the Claudine Hellmuth stamps. Then I doodled a frame and a chain for the cage. BTW : this is a one- layer -card : sent from the UK to Australia. Very beautiful one layer card. Nice effect stamping both with purple and black and the doodled lines is a great way to frame the scene. Fabulous one layer card, great stamping!